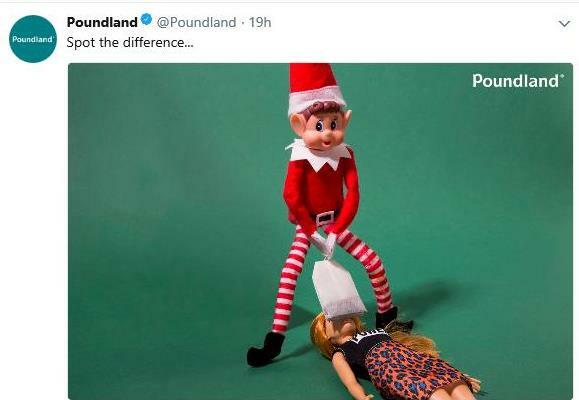 The Advertising Standards Authority has ruled that a risqué festive Twitter campaign by Poundland is offensive and must not be repeated - but the retailer isn't taking it lying down. The regulator today said that the tweets sent by the budget chain were "offensive" and "unsuitable to be displayed in an untargeted medium where children could see them". 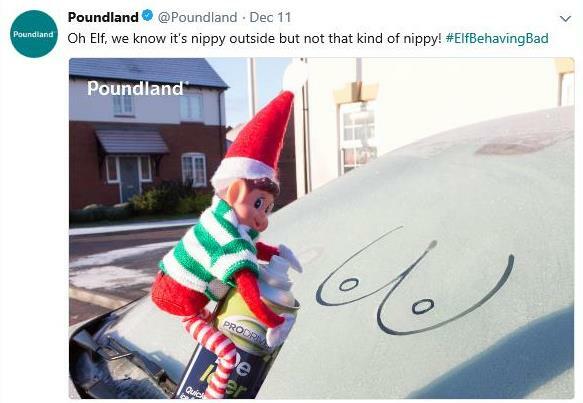 Ahead of Christmas, Poundland published eight posts featuring an elf toy in a number of sexually suggestive poses, complete with copy containing double entendres (see gallery above). The campaign was devised in-house. These drew mixed reactions, with the company apologising to individual Twitter users who took offence. It also drew the ire of Twinings - the tea brand objected to its package being on display in one of the images (below), and the image was reposted with the box removed. The campaign appeared to pull off strong results - Poundland claimed in a January trading update that its "low cost but highly effective marketing strategy" had helped it to a marked increase in pre-Christmas trading. The campaign led to 85 complaints finding their way to the ASA's mailbag, but Poundland stood by its work, saying that "thousands" of people had enjoyed the campaign and commenting: "We're just pleased the number of people who didn't get the joke is so small." Asked to respond, Poundland said that the nature of a double entendre "was that they would not be understood by children", pointed out that Twitter and Facebook prevented under-13s from creating accounts on their websites, and said that the company "never sought to encourage anyone other than adults to follow Poundland on these social networks", according to today's ASA ruling. Poundland also said that "a large number of people found the campaign to be humorous, engaging, and in line with what it meant to be British", according to the body. However, the ASA said that the ads contained a number of "obvious references to sexual acts", and that its "depiction of a child’s toy in relation to such sexual references and acts in a medium which could also be accessed by children was irresponsible and likely to cause serious or widespread offence". It also said that two of the images presented female dolls "in a manner which could be seen as demeaning to women". 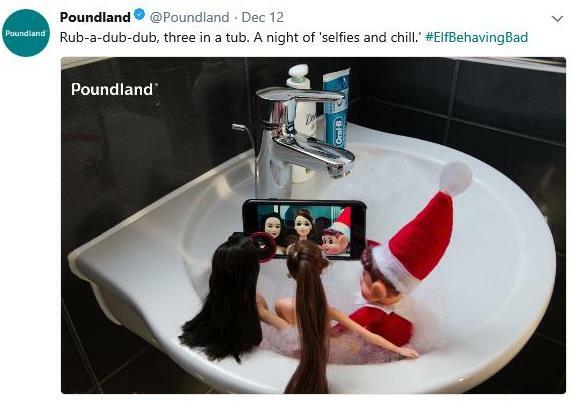 On hearing of the ASA ban, Poundland created a page on its website including an image of its elf protagonist behind bars, and a letter it says was written by the elf from its cell. The statement reads: "Britain's the home of saucy postcards, Carry On films and panto, so I’m sad the ASA found my double entendres hard to swallow. At least it’s only 84 people who had a sense of humour failure compared to the tens of thousands who got the joke and liked and shared my posts online. "I’m doing everything I can to be good so I can get out on good behaviour later this year. Love, Elfie x"
The same page on the company's CSR and charity-focused 'Proudland' website contains two letters that the retailer had sent to ASA during its investigation. Alongside various matters raised around the ASA's process, the second of these states: "We challenge strongly any suggestion that any of our posts were demeaning to women – indeed the team that worked on them was an all-female team and as you will note in the evidence we have presented to you, the posts were well received by men and women alike." Asked by PRWeek why it wasn't taking the ASA ruling more seriously, Poundland's PR firm One Green Bean said in a statement: "We take our stance from that expressed by our customers - which was almost universally supportive."